You can start FileBoss and reset all its options or just ignoring the general settings, the layout of the menus, toolbars and docking windows and/or the tabs from the previous session. 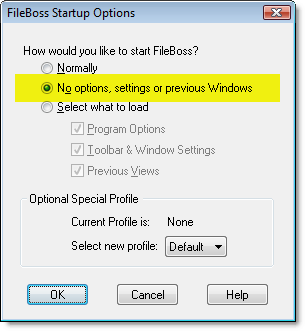 Selecting any option other than Normally will force FileBoss to display the Exit Options dialog described below. This prevents your current options and settings from being lost by mistake. 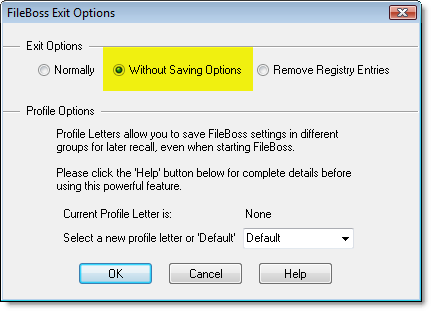 In the popup dialog select how you want to exit FileBoss. Note that if you started FileBoss using the method described above this dialog prompting for exit options will appear automatically when you close FileBoss.